I’m back from NYC, filled with enough carb-alicious food to last me a year, and ready to cap off these Valentine’s Day projects with a bang! This year was the first year I’ve actually started on Valentine’s Day projects early, so I’ve had plenty of time to get my red & pink fill for another year. It’s always a little sad to pack up the heart goodies, but even harder to accept the fact that I now need to go buy a new magenta ink cartridge after printing off a ridiculous amount of pink lips, strawberry boxes, and emergency Vitamin C kits. 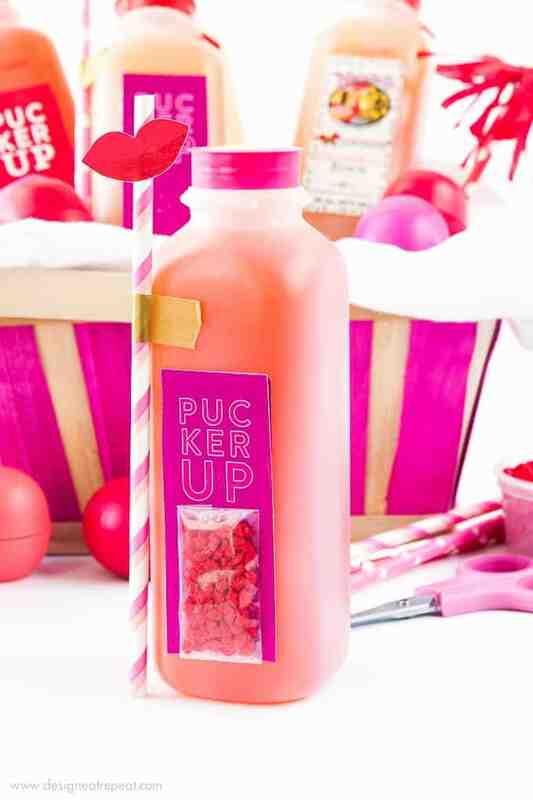 But it’s totally worth it, because without that printer, we wouldn’t have these “Pucker Up” labels to stick on the most adorable, tasty, and tart juice bottles! So pucker up, because things are about to get crazy tasty. There are three things I think of when I think of the word Pucker. 1.) Lip Gloss, 2.) Lemons, and 3.) Lips like Sugar. 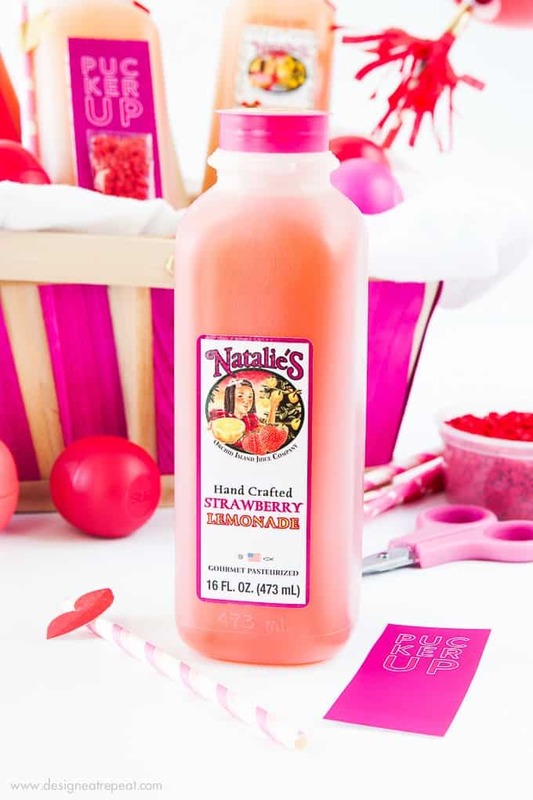 So I figured I’d combine the three to show you how to dress up these individual Natalie’s juices to create fun Valentine’s drinks to pair with your favorite treat! Besides, you need something to wash down all that candy don’t you? 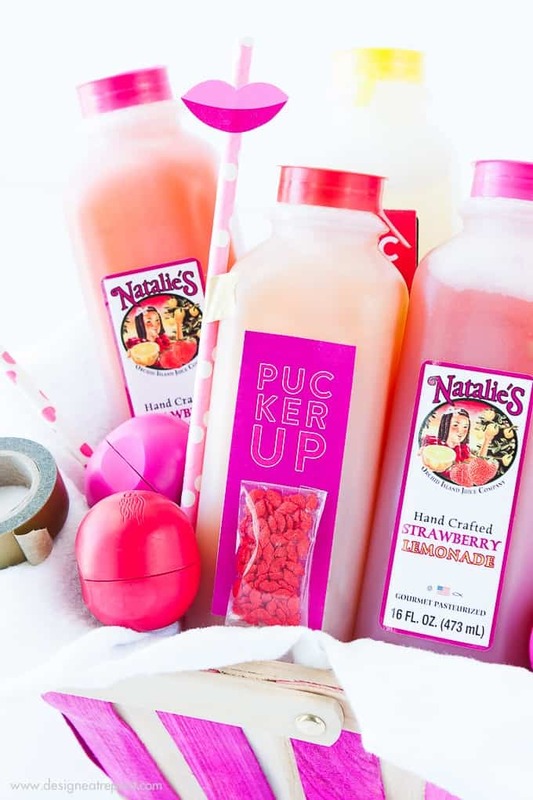 To start, you’ll need to pick out your favorite Natalie’s juice flavors! Since I was going for a red/pink theme, I decided to use the Strawberry Lemonade, Grapefruit and regular lemonade for this project. All of Natalie’s juices are 100% all natural with no added sugars – making them a easy choice among the list of other sugary Valentine’s Day drinks. 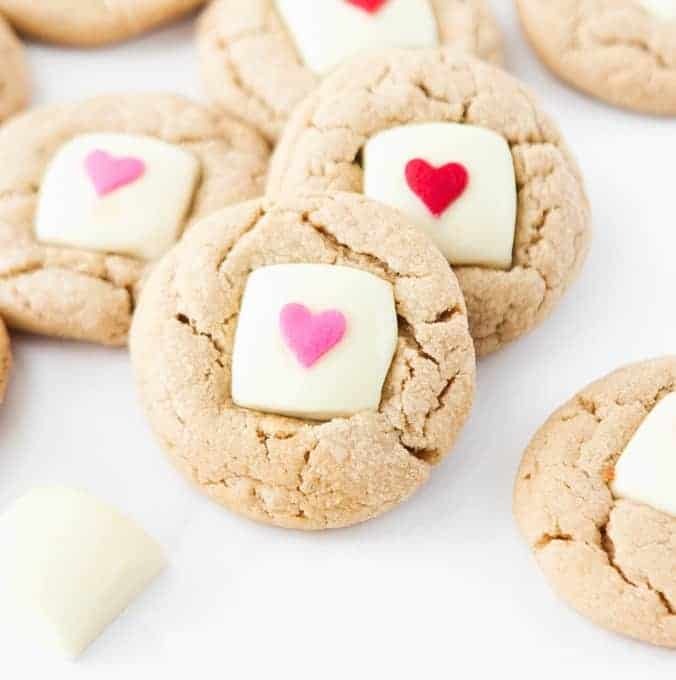 How perfect are these colors for Valentine’s Day? 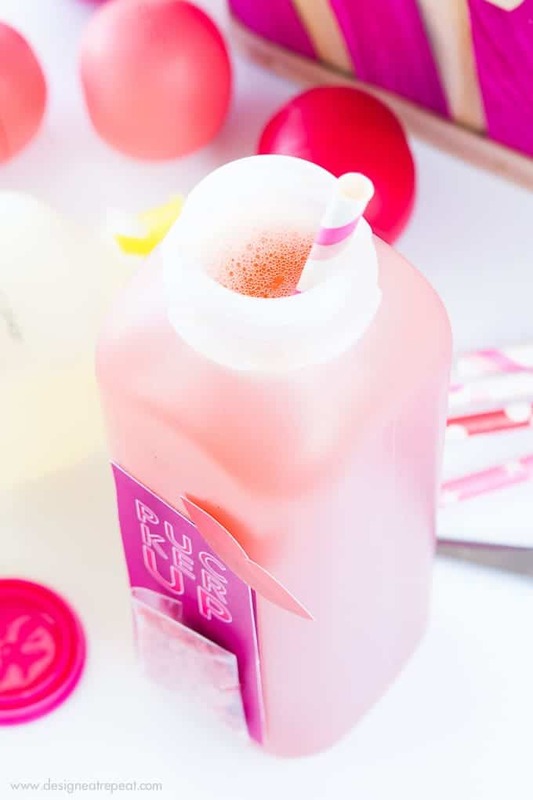 After printing out the Pucker Labels, I filled small plastic bags with red lip sprinkles that would hang on the front of each bottle. 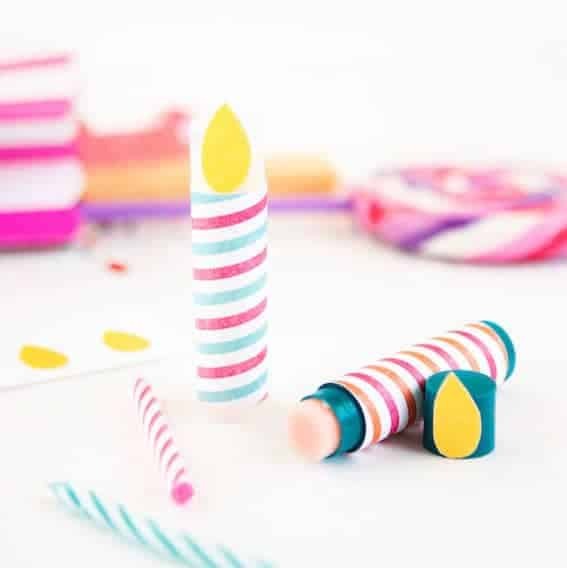 These little sprinkle pouches can easily be removed from the bottles before tossing, leaving your guests or recipients with little party favors to bring home to bake with. 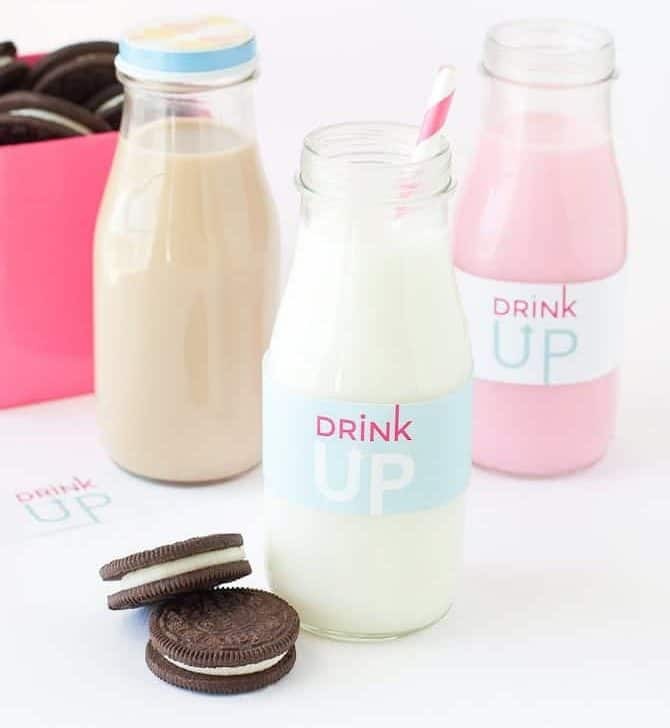 The final step was to attach the tag and sprinkle bags to the bottles and then attach the lip printable to the top of a paper straw. 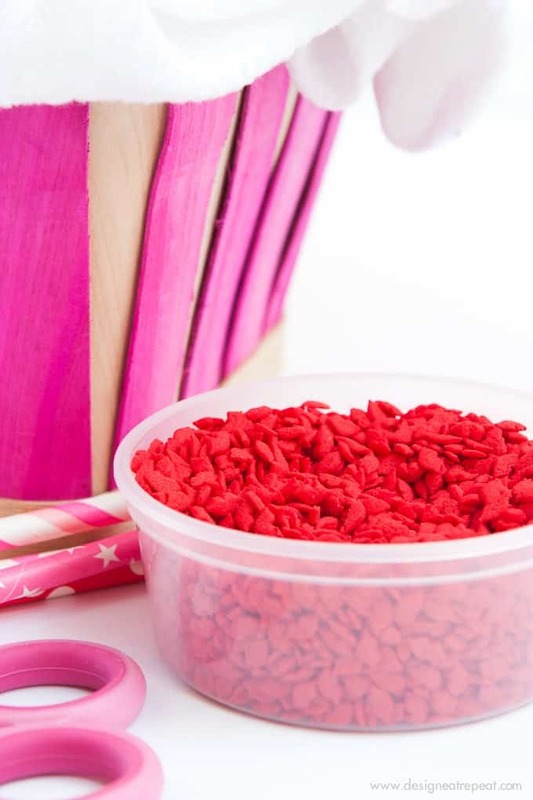 Because if red lip sprinkles weren’t enough, we obviously needed a red lip to go with it. When in doubt, always add the red lip. I tossed them all into a cute $3 pink basket (Target dollar section, baby!) along with some leftover EOS balms from a Christmas project to allow guests to pick their own flavors of juices and lip balms. Yeahhh, buddy. How’s this for a bubbly refreshment? Can it just be summer yet, puhlease? 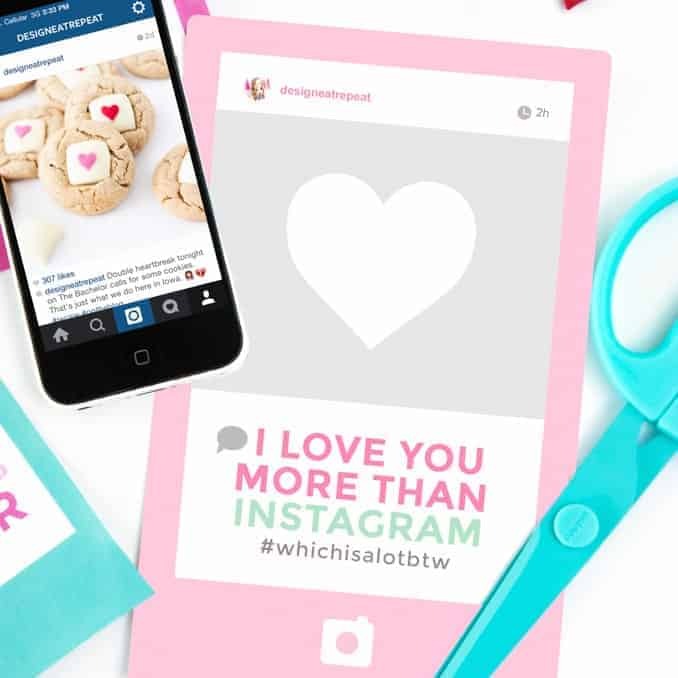 This is the final Valentine’s Day post for this year, but you can find more Valentine’s Day projects, printables, and recipes over in the Valentine’s Day Archives! Have you tried one of Natalie’s Juices before? What is your favorite flavor? This is perfect! Absolutely perfect. I have never heard of Nathalie’s Juices before but they look delicious! Oh girl, they are SO good! The Strawberry Lemonade is to die for!